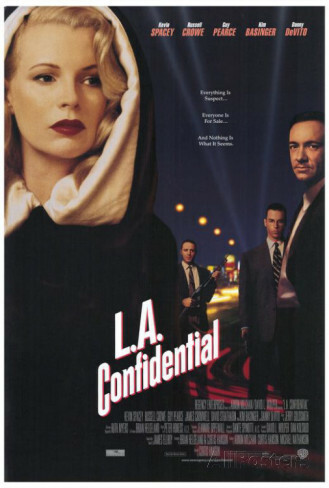 Synopsis: As corruption grows in 1950s Los Angeles, three policemen – one strait-laced, one brutal, and one sleazy – investigate a series of murders with their own brand of justice. Quotables: LYNN: There’s blood on your jacket. Is that an integral part of your job? Holy hell, this movie is intense! I was not expecting that twist. The film tackles a wide array of police corruption from frame-ups to cover-ups and everything in between. It’s a really great story, and now I want to read the novels, The L.A. Quartet, by James Ellroy, which are loosely based on actual events. Definitely worth a watch a time or two.